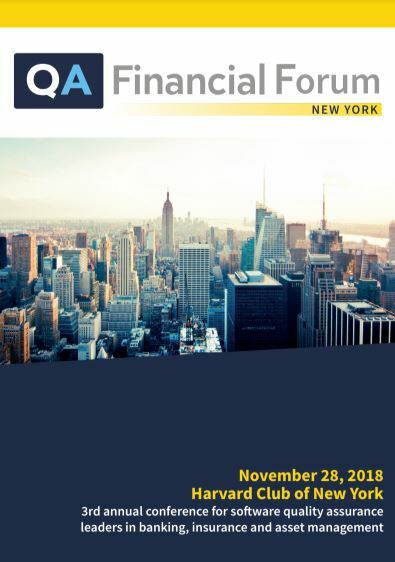 Major financial firms such as J.P. Morgan Chase and Transamerica will be sharing the story of their digital journey at the QA Financial forum New York in November 2018. This will be our third event at the Harvard Club of New York City, and delegate places at this refined and convenient venue are strictly limited. This Chatham House Rule conference is designed to promote the sharing of information between heads of quality assurance and platform architecture at financial firms, as well as other key decision-makers and stakeholders in IT investment, such as operational risk managers and IT risk managers. As regulators around the world increase the detail of their scrutiny of the development of apps at banks, insurers and asset managers, our speakers will discuss the technical requirements of embedding compliance in the SDLC. Other key topics include machine learning for test automation and the testing and quality assurance of Blockchain platforms. Ilya Lyubarsky is a Technology leader with over 20 years of experience in the financial services industry. He has a demonstrated track record of delivering technology solutions including Electronic Trading Systems and Risk Management Systems for Equities, Fixed Income and Derivatives. With his passion for innovation Ilya brings a diverse set of expertise and experience ranging from business architecture, integration and application architecture, all aspects of the SDLC, and managing global teams to execute large-scale software development projects. Ilya holds a Master of Science degree in Electrical Engineering from New York University. Tatyana Kravtsiv is a technology professional and innovative leader who specializes in optimizing and transforming software development and quality assurance services. Tatyana has 20 years’ experience of project management, quality assurance and software change implementation across a range of technology platforms, products and businesses. She has managed large composite development processes for multi-stream programmes in complex, multi-stakeholder matrix-driven technology environments. In doing so, Tatyana has led the delivery of projects in outsourced environments, liaising with multiple business units, conflicting priorities and projects. She takes great pride in her personal commitment to ensuring delivery standards are continually sustained within internal teams and partner organizations. In all her roles, Tatyana has managed, motivated and delivered on technology commitments by implementing effective communication and engagement at all levels. She transformed several QA groups to become quality gate-keepers rather than testers, by building geographically diverse teams with a culture of inclusion, while identifying and developing future leaders. Tatyana is passionate about the software quality assurance, and accelerating technology quality and testing journey across organizations. François Ruchon is SVP – Head North America, Banking, Financial Services & Insurance at CAST, the leader in Software Intelligence. His focus is to assist CIOs of large BFSI organizations by providing insight on the tangible value and benefits of measuring software from a non-functional perspective, in an automated manner, and in broader terms, of measuring their application development and maintenance organization to reduce risk, cost and create greater velocity. He works at C-level with Banks, Financial Institutions and Insurance companies, whether in Digital Transformation, pre & post M&A, Lean IT or simply IT continuous improvement scenarios. Prior to his current role, he’s been Group CFO of CAST, General Manager of CAST France, Managing Director of CAST India. He holds a degree in Computer Science and an MBA from CASS University in London. Mohan is a Technology executive with over 20 years of experience leading IT functions, and delivering change initiatives in the Insurance industry. Currently serving at AXA XL as Head of Application development - Corporate Systems, supporting Finance, Treasury, Tax, Actuarial, Human Resources, Marketing and Communication, Planning, Global sourcing, Workplace, Legal and Compliance functions. Mohan’s people focus includes developing future IT leaders and talent to ensure continued success aligning with AXA XL’s growth objectives. Assembling people with diverse talent and enabling them to become change agents is a model Mohan has practiced over the years. He credits his past success to a number of business and technology leaders he had the privilege to work with and learn from. He aspires to continue to learn new things from everyone who touches his life and contribute to make this world a better place - in any small way possible. Kevin is AVP and Head of Software Quality Assurance at Privilege Underwriters for the past two year. He has more than twenty years' experience in the IT industry with the majority of that time in the QA field primarily in Pharma, Utility & Financial - Insurance. He is passionate about building quality software, continually evaluating new approaches and technologies and driving cost efficiency by leveraging automation, process improvement, continuous learning and QA optimization techniques. Will Lukang joined UBS in April 2007. During his time with the firm, he's performed numerous roles in technology for the wealth management US business including development group manager and the head of QA and testing. Before joining UBS, Will was with Prudential Financial for 7 years, where he served as Vice President for Managed Account platform. Prior to joining Prudential, he spent 2 years with KPMG and has over 28 years of experience in information technology. Will earned his Bachelor of Science in Accounting from University of Santo Tomas. He has a Master of Business Administration with a concentration in Information Decision and Technology Management from IONA College and a Master of Arts in Strategic Communication and Leadership from Seton Hall. He is also a certified speaker, coach and trainer from John Maxwell Team. Ramkumar Ayyadurai is the Quality Assurance and Test Engineering Director for Equities at Citi. At Citi, his team is responsible for providing Quality Assurance and Engineering services for over 100+ applications globally. Ram is currently leading a multiyear Global QA transformation strategy around migrating away from archaic QA practices to a “Best in class” Test Engineering focused organization. His team is leading the charge around Enterprise Test Automation Framework, Virtualization, DevOps, Containerization, Cloud adoption within Quality Assurance/Test Engineering space. Ram has over 18 years of IT experience and majority of his career in Investment banking across banks including JP Morgan chase (UK), Merrill Lynch (US), Credit Suisse (US). Prior to Citi, Ram led the Quality Assurance function at Credit Suisse – Investment Banking division. During his tenure at Credit Suisse, he has established Industry award winning QA Engineering practices across Equities, Fixed Income, FX, Risk and Trading technologies IT. Yasar Sulaiman Everest Global Services, Inc.
global quality assurance teams. He is passionate about quality and loves new advances in technology. Nearly 20 years experience in leading and managing software quality assurance teams. Oversaw and managed the quality assurance efforts for complex implantation such as, a U.S. equities exchange system, and complex global Buy and Sell side applications, including global trade order management system, crossing engines, US and European electronic trading system, interfaces to exchanges in Europe, Asia Pacific, and the US, and global back office clearing system. My team also certified the complex implementations of Sales Force and Micro Strategy’s BI systems, as well as Adobe content management implementation. Colin is the VP Common Services within the Federal Reserve Bank of New York (FRSBNY) and is responsible for multiple technology teams including Enterprise Data Management Services; Engineering; Emerging Technologies; Digital Experience; Reusable libraries & Micro-Services and a System Tooling (for CI/CD). These teams are responsible for changing the way we think about building applications across the Federal Reserve System (FRS). Colin works with various businesses across the FRS as well as responsible for supporting over 1,000 developers that build and maintain critical applications including Fedwire. Colin has been with the NY bank for seven years. Colin started his career with Hewlett-Packard in England and has a degree in Computing Science from the University of Glasgow. Alexandra Shulman-Peleg, Ph.D, is a Senior Vice President leading Citi's Cloud platforms security engineering as well as the global information security Cloud program. In her role she is responsible for the Cloud and Container security solutions, processes and architectures. She previously led Cloud security at IBM Cyber Security Center of Excellence and IBM Haifa Research Labs. She holds Ph.D., M.Sc. and B.Sc. degrees in Computer Science from Tel-Aviv University, having multiple patents and more than 30 scientific publications having thousands of citations. Cindy is SVP, Cloud Risk, Security and Regulatory Governance at Bank of America in New York City. Analytics Cloud before joining IBM Watson Health. Anjali Chhabra Nandwani Tech Mahindra Americas Inc.
Anjali is a technology leader with 20 years of testing & QA leadership experience in Information Technology Services industry, with specialization in optimizing Software Development Lifecycle ( SDLC) and Quality Assurance Services. She has worked with large enterprise customers ranging from Banking and Financial Services, Telecommunication, Technology to various verticals. She has proven track record on DevQAOps Transformation initiatives, Consulting for DevOps and Agile Transformation initiatives, Automated Delivery Pipeline (CI/CD/CT) framework design and set-up for large enterprises, QA Community of Practice (COP) set-up, DevQAOps Program Management and Governance. In her role, she has worked with diverse IT teams globally to optimize SDLC with usage of Predictive Analytics, Machine Learning and RPA. She comes with in-depth understanding of Integrated SDLC Automation experience along with framework design / tool selection and ROI analysis. Michael is a leader in the fields of QA, software testing, and process improvement. Michael brings more than 16 years of hands-on QA and Testing leadership experience. Prior to joining Transamerica, Michael was the Chief Quality Officer at W3 and World Wide QA and Testing Evangelist with HP Software. Before joining HP, Michael was Head of Enterprise Quality Management (EQM) at T-Mobile USA, reporting directly to the CIO; he led a team of more than 400 QA professionals. While at T-Mobile Michael and his team partnered closely with Amdocs on an QA, Testing and Infrastructure Services that increased productivity, reduced system downtime and provided the foundation an enormously successful growth strategy. Michael also held Senior QA and Testing leadership positions at FICO., Inovis and Equifax. Michael participates in the QA community as a strategic Advisor to leading companies including Amdocs and his recognized for his work around the future of QA and Testing. Michael has presented at conferences around the globe including SAP Saphire/TechED, HP Discover, Amdocs InTouch, QAI Quest, StarEast/West and EuroStar and many more. Michael graduated with honors from the University of Florida, studied abroad at the University of Cambridge and earned a MBA from Georgia State University; he is also a Certified Scrum Master. Recognitions include the 2011 HP Software Award of Excellence Americas – People’s Choice, the 2009 HP Software Award of Excellence for IT Transformation, T-Mobile CIO Award, and the Quality Leadership Executive of the Year Award in 2006. Norman Niemer is the Chief Data Scientist within UBS Asset Management's Quant & Data Science (QED) team where he delivers data-driven investment insights. He is also responsible for both the business as well as technical aspects of multiple innovation projects that augment human decision makers with machine intelligence. Prior to UBS Asset Management, Norman led the data science efforts at UBS O'Connor, worked as an investment analyst at Caxton Associates and Morgan Stanley and even founded a tech company in high school. Outside of investment management, he has led teams that built data- and AI-based products that won several high profile hackathons including Techcrunch NY, Fintech NY and Mastercard Masters of Code NY. He holds a MS Financial Engineering from Columbia University and a BS in Banking and Finance from Cass Business School (London). Throughout his career Byron has placed technology in the service of organizational change. His passion is helping technologists deliver greater value to their organizations and constituents. He’s led successful internal start-ups for The University of Wisconsin, Digital Equipment Corporation, Berbee Information Networks, and others. His leadership has enhanced the effectiveness of technology for Boeing, Toys R Us, General Motors, Nielsen and the American Kidney Foundation of Wisconsin. Byron is currently part of the I/S Quality Engineering team at American Family Insurance in Madison, Wisconsin. Matt is a senior operations leader specializing in financial and compliance management for institutional investors focused on both public and private markets. He currently serves as COO and CCO of Edgehill Endowment Partners, an Outsourced Chief Investment Officer managing portfolios for endowment and foundation clients. Matt previously was the COO at Bryn Mawr Capital Management, a quantitative hedge fund, and worked in various management roles for the Vanguard Group. He has many years of experience working with risk management, trading, performance reporting and CRM applications, and appreciates sharing insights on the technology implementation process with peers. Chris currently serves as the Assistant Director of Anti-Money Laundering at Valley National Bank where, among other duties, he oversees the Quality Assurance program. Prior to his current role, Chris was brought on board at Valley to directly manage and expand QA of the BSA program. Functioning independently of the BSA Compliance team, reporting directly to Valley’s Deputy Chief Risk Officer, Chris was given a broad mandate to ensure the proper and efficient functioning of the BSA program, and expanded the QA program beyond investigative reviews to include all aspects of the BSA program. Before managing the QA program at Valley, Chris spent eight years at Gain Capital Group, LLC, where he served as AML Compliance Officer. Murtaza is an accomplished FinTech Leader with more than 13 years of management experience, offering expertise in process redesign, financial technology solutions, and risk & regulatory reform to large investment banks and global financial institutions such as World Bank and Federal Reserve Board. Murtaza possesses strong leadership skills for highly complex organizations and has a successful track record for directing large change management initiatives, revamping business processes, and increasing efficiency for respected clients in the Financial Services industry. He holds both undergraduate and graduate degrees in Management Information Systems from the University of Maryland and an Executive MBA degree from the University of North Carolina at Chapel Hill. A lack of effective automated testing limits many firms in the DevOps implementation. Poor test data quality and an inability to test components independently of each other compound the challenge of “shifting left”. Sundeep Kumar will explain how by employing service virtualization, production data sand boxing and machine learning techniques, we can enable the full potential of DevOps implementation and achieve true quality. As blockchain technologies become more widely used by financial firms, questions remain over improving security and testing for distributed ledger platforms. How do firms test smart contracts? Our experts will discuss emerging industry standards for testing, and how readiness for test automation can be embedded in contract and platform construction. Justin Hunter has worked with Fortune 2000 Financial Services firms across six continents to help them adopt new testing tools and techniques at scale. Working in some environments, he has felt like Sisyphus, forever condemned to roll a boulder uphill only to watch it roll back down again. In other situations, things clicked; teams smoothly adopted new tools and techniques and impressive results were quickly achieved. In this presentation, Justin will discuss several common challenges that he sees teams at Financial Services firms face, and share actionable recommendations to consider when you roll out new tools and testing approaches. As we move into DevOps 2.0, there is an opportunity for QA leaders and teams to evolve and expand their influence within the IT organization of financial firms - by assessing the engineering quality of systems. However, this opportunity demands new skill sets and perspectives that traditional quality teams must adopt. Our panellists will describe the meaning of “engineering quality”, address how they are motivating QA teams to "shift left,” and share how they are helping them develop engineering disciplines in coding, architecture, and system thinking. Charles Schwab transformed the quality assurance process for its Intelligent Portfolios robo-advisory platform product team by adopting a “shift left” continuous testing approach and validating quality through automation. In this presentation, Michael Schober and Bala Mukund will detail how they led this transformation of Schwab’s Wealth Management Technology team with the help of automated continuous testing via Sauce Labs. Delegates will learn how to streamline the software development process, practical processes for implementing continuous testing and how to reshape DevOps culture to better meet customer needs and expectations. Speaker: Yasar Sulaiman, Director of Quality Assurance ETS - Everest Global Services, Inc.
Everest Re Group is undertaking a rapid transformation, not least in its technology group - Everest Technology Services - which provides support to its insurance and reinsurance businesses. In this session, Yasar Sulaiman will detail how Everest has transformed software quality assurance at the enterprise level and how his team met the challenges they faced across multiple business divisions, dealing with complex new tools and an urgency for innovation while optimizing cost and resources. The QA practice not only had to keep up but also lead the way in many areas. Designing an effective architecture for quality in a waterfall SDLC is challenging and no easier in agile. Based on original QA Vector® Research work, Justyn will present an analysis of key dangers and opportunities in the journey between them, highlighting three key starting essentials. Today’s market environment demands more changes and more testing than ever before. While core banking systems such as Temenos T24 and Oracle FLEXCUBE offer banks the opportunity to acquire a single off-the-shelf platform, comprehensive end-to-end testing in this context creates a major challenge, as every function must be linked to that platform. Renovite Technologies’ Jim Tomaney will introduce the session with an overview of how this challenge can be met, followed by a discussion that will compare the experience of two leading financial firms. This expert panel discussion on managing software security and IT risk in the cloud will focus on​ two critical topics. First how financial firms are managing compliance requirements for security and data protection and, secondly, the evolution of IT risk management as more firms move to the Cloud and software-as-a-service models. How are financial firms managing third party vendor in this new environment, and are are they closer to agreeing industry standards with regulators? Speaker: Anjali Chhabra Nandwani, VP & Head of Digital Assurance Services - Tech Mahindra Americas Inc.
Where software quality assurance works in silo, it can work against the objective of achieving continuous software delivery. Using the example of a transformation programme at a leading bank, this presentation will illustrate some of the key pitfalls organisations face as they move towards Agile and DevOps. Continuous testing through the implementation of an ‘intelligent automation platform’ is the key objective, and this session will detail the key components of that platform: project portfolio management, Agile Management, configuration management, test design techniques for continuous testing, test data management, test execution, intelligent reporting and the application of AI to data lakes to enable cognitive DevOps. The number one challenge in software quality assurance for financial firms? Many would say it is embedding regulatory compliance while automating and accelerating delivery. Michael Cooper will demonstrate how Transamerica has managed that transition whilst explaining how financial firms, large and small, can develop a "regulation strategic" quality assurance practice that combines tools for agile testing and business-driven development (BDD) that meet the regulatory challenge. Everyone is talking about AI and machine learning - but how will firms test machine learning systems as they increasingly become a reality? Our expert panellists will discuss these challenges and more with, who will share their insights on the challenges that financial firms face when it comes to testing apps and financial software, and also the potential uses for Machine Learning within QA processes. Automation is often presented as a silver bullet or magical solution; however, experience and practice has taught the QA community there are pitfalls on the path to automation success. In this talk, the audience learn how to build a robust automation solution across the enterprise to improve application quality, testing efficiency, and lower operational costs whilst ensuring they can achieve this goal without affecting project delivery time. The solution incorporates both open-source tools and a cloud platform to establish a continuous automated testing environment ready for DevOps integration. Financial firms are under growing pressure to document testing infrastructures, and to test their software development architecture to ensure acceptable risk management procedures are in place. This panel will in particular focus on the challenges presented by Fundamental Review of the Trading Book (FRTB) which requires firms to link trading desk data systems to risk systems and brings with it a slew of new testing requirements. Additionally our expert speakers will examine the challenges of meeting the KYC guidelines, and explore the potential and limitations of AI as it can be applied to KYC. As the focus of payments shifts towards delivering convenience to consumers, businesses seek technologies for seamless payment switching and authorization, with optimized transaction routing. Customer-facing payment technologies have witnessed rapid innovation, but the back end infrastructure still hinders better payment experiences. Renovite Technologies saw the relevance of an integrated payment platform for financial institutions, retailers and processors struggling with old payment tokens, fixed transaction routing and proprietary systems, and successfully decoded the maze of infrastructure challenges they faced. Renovite Technologies challenges legacy thinking in the payments industry, and delivers cutting-edge payment solutions based on continuous delivery or DevOps principles. At Applitools, we’re on a mission to help test automation, DevOps, and software engineering teams release mobile and web apps that are visually perfect. We provide the only commercial-grade, visual AI-based test cloud that validates the user interface of any app in a fully automated manner, with our ground-breaking image processing stack that we developed from scratch in-house. Digital transformation and enterprise agile are today high on the agenda of large organizations pursuing a competitive advantage and an ability to respond to rapidly changing client demands. In this everchanging landscape it is vital to have business critical information at your fingertips. Assure is the leading provider of business intelligence, for quality assurance and application delivery, that enables you to make data driven decisions. Assure safe guards an organizations digital transformation journey by providing interactive dashboards that enable governance and control of your digital assets, mitigation of software risk and a substantial improvement of time to market. The Assure TotalView platform – Insights, Data and Standardization provides a robust, scalable and extendable solution for the enterprise that delivers accurate information and intelligent insights to decision makers and management. Assure is also an award-winning Micro Focus Partner specializing in services and solutions for Micro Focus ALM. Infostretch is a digital-first professional services firm. The company helps enterprises get digital right, the first time, by combining ready-made tools, frameworks, technologies, and partnerships with our in-depth experience. Infostretch helps clients deliver solutions that work seamlessly across channels, leverage predictive analytics to optimize the software lifecycle, and support continuous innovation.